National Park or National Forest? *** Please check the "Backcountry Facilities" section of the Temporary Road and Facilities Closures for any current trail or campsite closures (http://www.nps.gov/grsm/planyourvisit/temproadclose.htm) or contact the Backcountry Office at 865-436-1297. From this site, you may obtain basic trip planning information, check backcountry campsite and shelter availability, make backcountry reservations, pay fees and print your backcountry permit. At this time, the system is not set up to function with smart phones or tablet computers. Trip planning assistance is available through the Backcountry Office by calling 865-436-1297. The Backcountry Office is open every day from 8 am to 5 pm. First time or infrequent backcountry users are strongly encouraged to call the Backcountry Office at 865-436-1297 before using the system. All users should read through the basic trip planning information below, as well as Things You Need to Know before planning a trip. Permits obtained through this system are issued by email. If you do not have an email address, please contact the Backcountry Office at 865-436-1297. Reservations and permits are required for all overnight stays in the backcountry. Backcountry reservation fees are $4.00 per person, per night, with a maximum fee of $20.00 per person. Fees are non-refundable. Permits are good for 7 nights. Changes to a permit may be made one time. Call the Backcountry Office at 865-436-1297 for more information. Reservations/Permits may be obtained at any time up to 30 days in advance of the first night of your trip. The sites open for reservations on the website at midnight Mountain Daylight Time. Reservations/Permits may also be obtained in person at the Backcountry Office, located at Sugarlands Visitor Center, near Gatlinburg, TN. Maximum party size is 8, unless a specific site or shelter has lower limits. Two parties affiliated with the same group may not stay in the same campsite or at the same shelter on the same night(s). At some sites, special permits may be issued for parties of up to 12 people. Call the Backcountry Office at 865-436-1297 for more information. You may not stay consecutive nights at any shelter or at campsite 113. You may not stay in any other backcountry campsite for more than 3 consecutive nights. Please note that seasonal and weather-related road closures may affect your ability to access trailheads. Prior to starting your trip, please check http://www.nps.gov/grsm/ or call 865-436-1200 x 631 for park road information. A weather forecast may be obtained at http://www.weather.gov/ or by calling 865-436-1200 x 630. Please remember that road and weather conditions change constantly. Be prepared for the unexpected! As permit holder, you are responsible for your group, including everyone's safety and compliance with park rules and regulations. In order to obtain a permit, you must certify that you have adequately researched your trip and planned one that is appropriate for you and your group's physical abilities, backpacking experience, anticipated weather and route of travel. To help ensure that your trip is safe and enjoyable, we strongly encourage you to read Things You Need to Know before planning your trip or completing a reservation. Additional information for stock users can also be found there. The Smokies backcountry is a mountainous, wilderness environment and is much more challenging than many people realize. Any backcountry trip, even a short one, involves risk and requires careful planning. Trip planning assistance may be obtained through the Backcountry Information Office by calling 865-436-1297. Permitted stock are horses, mules, burros and llamas. Stock users must have a copy of a negative Coggins test for every equine in their party and keep a copy on hand at all times while they are in the park. Not all trails are open to stock use. Please check the map to ensure your planned route of travel is appropriate. When you are finished selecting your campsites/shelters for your itinerary, click the "Continue With Permit Application" button to fill out the rest of your backcountry permit application. Enter the system by clicking the "Begin Reservation" button. Enter the number in your party and the number of stock if applicable. Click on a campsite or shelter to view basic information and a calendar of availability. Hiker only sites are shown in red. Sites that allow stock are shown in green. Boat in only sites are shown in blue. Choose all the sites for your itinerary before checking out and obtaining your permit. IMPORTANT!! A session lasts only 15 minutes. So, when you start to make your itinerary, you must stay active on the site to keep your itinerary reserved. If you are inactive for 15 minutes, your itinerary is deleted and you will need to start a new itinerary. If you are having trouble with your itinerary not being saved, make sure you have session cookies enabled in your browser. When this map first loads, the whole map is displayed. You can zoom in on certain areas of the map in order to view the map details better. Use the buttons at the bottom of the map to zoom in or out on the map. You can use the pan right/left/up/down buttons to move around on the map or you can drag the map with your mouse. If you know site names or numbers, you can select them using the drop down in the upper right corner of the map. You can view the legend of the map in the lower right corner by zooming into it, or selecting it from the drop down (the last one in the list). Selecting a site from the drop down will navigate to the site by zooming and centering the site in the map viewing window. You can display basic site information, including a calendar of availability by clicking the red, green, or blue site numbers or shelters representing the site on the map. The date is in the upper right corner. The number in the lower left corner indicates the number of user spaces available for the site or shelter for that day. The number of stock spaces available at sites or shelters where stock is permitted is shown in parentheses. If space is available for the date you want, click on the date in the upper right corner to select that day and add it to your itinerary. If the site allows for more than one night, you will need to select the number of nights you want to use the site, then click the Continue button to add it to your itinerary and return to the map display page. 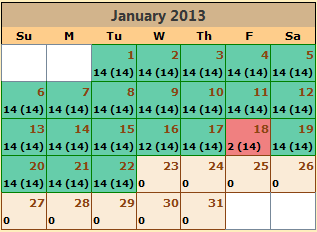 Or click the Cancel button to display the calendar again.